The Philadelphia Phillies are set to open the 136th season in franchise history this afternoon. Down in Atlanta, Georgia, the Fightin' Phils will take on the NL East Division rival Atlanta Braves in the first of a scheduled 162 games. There are a great many changes in the Phillies lineup and dugout from a year ago. 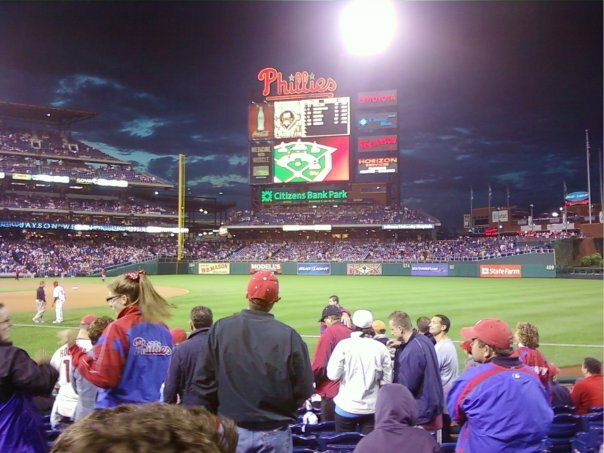 In my Phillies preview piece prior to 2017 Opening Day in Cincinnati, I stated "The lineup taking the field next week at Great American Ballpark should look very different from the one that will come to Florida next winter." That 2017 Phillies preview piece is well worth re-reading, because I was fairly dead-on in my assessment of where the team was at that point, and where they would be headed for this upcoming campaign. Gone are the "placeholder" players, as I have been calling them over the last few years. Dom Brown and Cody Asche have been joined by Freddy Galvis, Tommy Joseph, and Cameron Rupp in being shown the door. So here we are, at the dawn of what should be the next era of contending Phillies baseball. The team is not going to win the World Series this season. They are not even likely to make the playoffs. But for the first time in years we have a group of talented young players who bring hope for a brighter future that is right around the corner. They are led by a new-era style skipper in Gabe Kapler who is in better shape than any of them, and who has already demanded that they must "Be Bold" when approaching each game, as well as in preparing off the field. Let's take a look around the diamond at those players. Who is likely to start for the Phillies this season? What can we expect to see as the summer unfolds? How will the club finish? Will there be any big moves? There was much talk about lineup versatility and positional flexibility from Kapler this spring down in Clearwater. But as the regular season opens, I'm not really buying that we will see a lot of that from most of the lineup pieces. Given health, Phillies fans are going to watch a lineup most nights that includes Carlos Santana at 1st base, Cesar Hernandez at 2nd, J.P. Crawford at shortstop, and Maikel Franco at 3rd base. Jorge Alfaro will be behind the plate. Across the outfield it will be Rhys Hoskins in left, Odubel Herrera in center field, and Nick Williams in right. Three players who will come off the bench are going to play pivotal roles. Talented rookie Scott Kingery could play almost anywhere. Aaron Altherr should see plenty of time backing up all three of the outfielders. And backup catcher Andrew Knapp will get plenty of work as well. Kapler decided to keep versatile infielder Pedro Florimon on the opening roster. He can play second base, shortstop, and even some third base in a pinch. That "versatility" and "flexibility" is likely to come from finding ways to get Kingery into the lineup, and in juggling the four main outfielders. You might also see Hoskins play some first base, giving Santana a break against some tough lefties. I expect that the lineup might still struggle to consistently score runs in the early going. That is a product of a combination of factors, mostly their overall youth and the typically cold early weather. My hope is that as the season wears on, and the young players gain valuable experience both in facing more MLB pitching and in playing together as a group, that we begin to see more offensive consistency. The Phillies might have snagged the biggest free agent this off-season with the late signing of right-hander Jake Arrieta. A former Cy Young Award winner, Arrieta will be the ace of the staff, and provides a much-needed veteran arm to lead a group that is otherwise very young. Aaron Nola gets the start on Opening Day, and is the clear #2 starter. I've been on record as saying that I think Nola is a solid #3-type starter for a playoff team. However, the former first round draft pick appears ready to step up his game to the #2-caliber starter level. Perhaps the most enigmatic and important starting pitcher on this staff for the 2018 season is righty Vince Velasquez. The lead piece that came back in the trade package for closer Ken Giles a couple of years ago, Velasquez has had consistency problems. Velasquez often blows through opposing lineups the first couple of times around. But he has struggled with command and control, leading to fast-rising pitch counts, and just as speedy exits from games. He must begin to get the Phillies into and through the 6th inning on a more consistent basis. I've been in Ben Lively's corner from the time he was acquired as a prospect from the Cincinnati Reds for Marlon Byrd a few years ago. While he won't overpower anyone, Lively keeps the Phillies in the vast majority of his starts, giving them a chance to win most nights. That's really all you can ask from a back-end starting pitcher. The wildcard here is Nick Pivetta. The righty who came from the Nationals in the Jonathan Papelbon deal a couple of years ago is being given the chance at a rotation spot to open the season. He got the nod when Jerad Eickhoff got hurt, beating out Zach Eflin for the 5th starter role. Arrieta is still fine-tuning his game shape, and will continue to pitch down in Florida while the rest of the team opens the season. He is scheduled to join the club and makes his Phillies debut during the home opening series next weekend. As with every MLB team, this will be a key area for the 2018 Phillies. Assuming they stay healthy, Arreita and Nola give the Phillies a strong 1-2 punch at the top. Lively is likely to keep providing solid outings from the back. It will be the performances of Velasquez and the Pivetta-Eflin-Eickhoff grouping in the other two spots that will largely determine success or struggles in the standings. The front office spent a little money this off-season to bring in a pair of veteran right-handers for the bullpen. Both 37-year old Pat Neshek and 31-year old Tommy Hunter should prove to be valuable additions to help hold down any late leads. Hunter starts the season on the DL after suffering what has been called a mild hamstring strain. Edubray Ramos and Luis Garcia should see key middle innings work from the right side, with Adam Morgan and Drew Hutchison getting most of the work from the left side. The closer will again be Hector Neris. The big 28-year old Dominican has always had the pure stuff to fill the role. If he can just start to show the mental toughness it requires, he could become one of the game's elite closers. The Phillies are carrying 13 pitchers to begin the season. That group is rounded out by a pair of righties in former starter Jake Thompson and Victor Arano, and southpaw Hoby Milner. Thompson probably gets any long relief work that might be needed. I said it in a recent appearance on the "Phillies Talk" podcast yesterday, and I've said it prior to that here at my website. I believe that new manager Gabe Kapler is the biggest single key to the Phillies performance this season. Though he has a ton of experience at multiple levels in the game, from player to front office, this will be Kapler's first experience in the dugout as a manager. The players seem to love his more aggressive style in the early going. How they respond to him, and how he personally handles the everyday grind over the course of a six-month season. How he manages those players and adjusts to in-game situations over the course of 162 games. That will be the biggest key, not just for this year, but moving forward as the club tries to return to contention. The rebuilding program is now over. What we are about to see are the first steps forward in building the Phillies roster back to consistent contending status. The team is likely to struggle under the weight of it's mostly youthful lineup and rotation at times this season. There will be peaks where we glimpse what they are likely to become, but also valleys of maddening inconsistency. In the end, I am calling this an 82-80, second place finish in the National League East Division standings. For me, the Washington Nationals are clear division favorites. The Miami Marlins are clear cellar-dwellers. You could put this year's Phils in a hat with the New York Mets and Atlanta Braves, pull the names out in any order, and they could finish in that order. I think that the Mets are a dysfunctional group with over-rated position players. The Braves are in the same rebuilding status as the Phillies are now exiting. Key injuries and actual production from young players will make the difference in these three teams finishing ahead of one another. So there you have it, my 2018 Philadelphia Phillies preview and prediction rundown. One other important factor to keep in mind: the Phillies are still in a tremendous financial position. This club can take on at least a couple of big contracts. If the Phillies are indeed somehow in playoff contention come the MLB All-Star break in mid-July, don't be surprised to find that they are buyers for the first time in years. If that happens, we could actually find them in the midst of meaningful September stretch run games for the first time since 2011.